More than two years ago I wrote about what we look for in early-stage SaaS startups. Since then we've looked at hundreds of SaaS startups and have gained additional insights through the work that we've been doing with the SaaS startups that we have invested in. Therefore I thought it would be time for a follow-on post with some additional thoughts. In the original post I focused primarily on early metrics as an indicator of product/market fit and of a favorable CAC/CLTV ratio in the future. Today I want to put more focus on factors that kick in a little later in the lifecycle of a SaaS company – aspects that have an impact on a company's ability to scale customer acquisition, increase ARPA and create lock-in. In other words, factors that can make the difference between a "good" and a "great" business. Search volume on Google is a good indicator of the awareness for the problem that you're solving. You may have a fantastic solution for a big problem, but if no one is looking for it, marketing it will be much harder. It means you'll have to spend more effort on educating the market and that you may not have a lot of low-hanging fruits on the customer acquisition front. Related to search volume is of course competition for the relevant keywords, both with respect to SEM/PPC and SEO. If there's lots of competition for your keywords, PPC advertising might be prohibitively expensive and SEO will be much harder. If, in contrast, there's high search volume and limited competition this not only indicates demand for your product, a gap in the market and potential to acquire customers via SEO/SEM. It also means that you have an opportunity to establish yourself as the thought leader in your space by doing great content marketing. Selling to big enterprises is tempting because one big enterprise deal can be worth tens or hundreds of thousands of dollars. But it's also tough: Sales cycles are long, you need to convince various different stakeholders, there are special requirements for the product and you have to do multiple meetings to get the deal. Anyone who's done or tried it knows what I mean. Conversely, selling to SMBs is much easier, but the value of each customer is obviously a lot lower as well. A "land and expand" or "bottom up" customer acquisition strategy has the potential to give you the best of both worlds. There are different variations of this strategy, but the idea is always that a single user or a small team of people inside a company starts using your product, making the initial sale easy (if any "selling" is involved at all). Over time, more and more people inside the company use it, and eventually you can sell an enterprise account to the entire company. Perhaps the most famous example of a successful bottom up adoption is enterprise social network Yammer. Within the first two years after launch, the company's freemium distribution model attracted users from 80% of the Fortune 500 companies and got Yammer into more than 90,000 customers. According to this Mashable article, 15% of these companies subsequently upgraded to a paid plan. Since you want to sign up users with little to no sales efforts you need a great marketing website and frictionless onboarding. Your product needs to provide value for a small number of users inside a company but even larger value if more people use it. Your pricing needs to be highly differentiated – make your product cheap or even free for a small number of users to maximize distribution and make money out of bigger accounts. Once you want to sell bigger team accounts or enterprise accounts you need to provide the functionalities required by bigger companies (a sophisticated role/permission system, SLAs, audit logs, etc.) while still keeping the product easy to onboard and use. It's very rare for B2B SaaS applications to get really viral, i.e. have a viral coefficient of over 1. However, even though your SaaS product will never get Hotmail/Skype/Instagram/Snapchat-like growth, any level of virality is valuable because it means you're augmenting your paid user acquisitions with free users. A use case which involves communication, collaboration, file sharing or the like with external parties. Examples include project management software like Basecamp (where e.g. an agency invites a client to a Basecamp project), e-signing solutions like EchoSign (where the person who is asked to sign learns about EchoSign during the process) or file sharing providers like Dropbox (you got the idea). The more affinity there is between your target group and their "collaborators", the better it is for you, since it means a higher "invite to signup" conversion rate. A use case where your customers use your software to create something which gets published on the Web. Examples: Shopify, SquareSpace, MailChimp or our portfolio company Typeform. Another example is Zendesk's feedback tab. The signup conversion rate is much lower in this case, but it can be offset if your product gets exposed to large numbers of people. Employee fluctuation: If you have a product that is used by lots of employees inside a company, try to make everyone an ambassador of your software who will suggest using your product in future jobs. Referral programs: FreeAgent's user-to-user referral scheme is a good example. Incentives along the lines of "get XYZ for a tweet", where users can e.g. unlock features or remove limitations by inviting people to your product. In the first couple of years you shouldn't worry too much about your long-term competitive advantages. Oftentimes execution is everything. Working harder than your competition, innovating faster and just doing everything a little bit better goes a long way. Having said that, the best and most profitable companies in the world are those which manage to create wide moats around them – sustainable competitive advantages that allow them to keep market share and profit margins in spite of aggressive competitors. The best examples for wide economic moat are patents (think pharma) and natural monopolies (think eBay). A platform. The best example is the Force.com platform. The large number of applications that integrate with Salesforce.com make Salesforce.com the most comprehensive CRM solution on the market and give the company a huge competitive edge. This is a classic example of a virtuous circle: More customers attract more developers which in turn attract more customers. When a platform has reached a certain size, it's very hard for competitors to attack you. Distribution channels: If you have thousands of partners who have been trained to sell your software and make a lot of money doing it, this can be another very valuable asset. Admittedly the role of VARs and other distribution partners is typically lower in SaaS than it is in traditional enterprise software, and the best example of an extremely valuable VAR channel is probably SAP. Lock-in: A great product with a fantastic user experience alone can create significant lock-in. 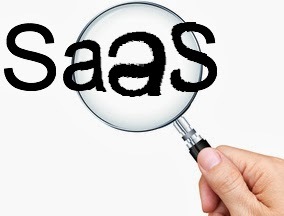 But different types of SaaS products have different levels of lock-in. The more people inside a company use your product, the more business partners interact with the software and the deeper the product is integrated into a company's core businesses processes, the higher are the switching costs. Network effects: Great examples include Freshbook's billing network and MailChimp's eMail Genome Project. What these two examples have in common is that (at least in theory) every users makes the product more valuable for all other users. Big data: If you have tens of thousands of customers, the massive amounts of data created by your customer base might allow you to draw insights which you can then give back to your customers. Zendesk's benchmarking reports come to mind as an example. I recently participated in Marco Montemagno's SuperSummit and gave a webinar about the topic "Measuring your SaaS success". Thanks, Marco, for inviting me! Below are the slides of my talk. Since some of the slides aren't self-explanatory I've added some notes, see the yellow bubbles. If you want to dive in deeper, check out this post, which the talk was based on. 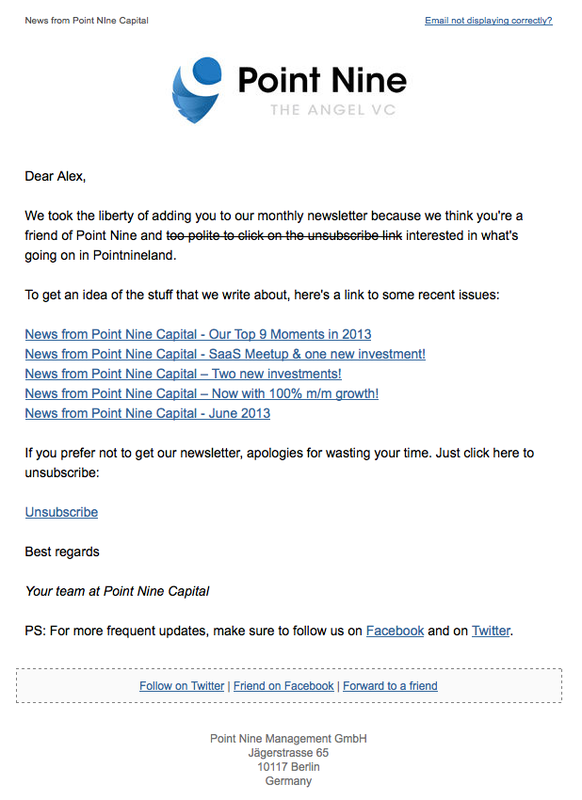 Some time ago I wrote that we at Point Nine love to eat our own dog food. That is, we run Point Nine almost exclusively on Cloud apps. We're also heavy users of Zendesk, Mention, Geckoboard and other products from our own portfolio companies. Another great example is Contactually. At its core, Contactually is a relationship management platform for salespeople and service providers in relationship-based businesses. The combination of two killer features – an address book that updates itself and a very smart system for so-called "follow-up reminders" – allows Contactually users to stay top of mind with all of their important contacts, which can have a huge positive impact on their business. One really really nice thing which Contactually does for us is that it continuously adds subscribers to our (in)famous newsletter – almost automatically. Here's how it works. 1) By scanning my email accounts, the software automatically adds all new people who I'm exchanging a message with as contacts. You only have to connect your email accounts once, Contactually does the rest. This takes just one click per contact (and you can also do it from your mobile). 3) Then the magic starts. 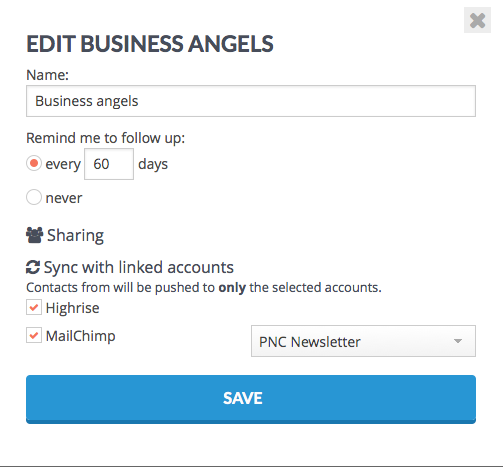 If I've added a contact to a bucket which is set to be synchronized with MailChimp, the contact will be pushed to our newsletter subscription list in MailChimp. 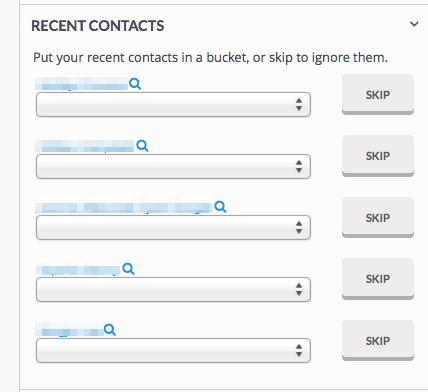 If I don't want want to add the contact to our newsletter I just use a different bucket, one which is not set up for synchronization with MailChimp. When we started this experiment we were of course wondering if it's too aggressive to automatically subscribe people to our newsletter. We came to the conclusion that it's OK if we're selective (i.e. only add people who we think are interested in news from us), have a fun confirmation email (see above) and have a one-click unsubscribe link. So far, we didn't receive a single complaint and very few people have unsubscribed, so it looks like it's working.